Mercedes Benz is known for its build quality and reliability worldwide. The company has constant thrust for new and extreme with premium build quality. 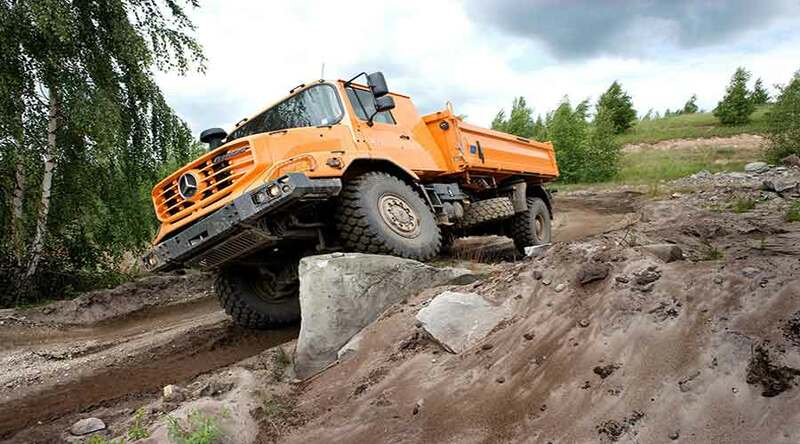 As a result, we have the toughest all-terrain truck - the Mercedes Benz Zetros. Zetros is a truck that is durable and reliable with working capabilities in harsh environments. The truck is flexible and adaptable to all kinds of transport requirement with easy mounting. In addition, it can operate with all kinds of bodies. Mercedes Benz Zetros is a bonnet type truck. The powerful engine with superior traction and wear resistance makes it ready to conquer any terrain. The Telligent engine system decreases fuel consumption; delivering a high level of efficiency. In addition, the smart axle configuration with tuned gears adds to the overall capabilities of Zetros. The Mercedes Benz Zetros has two options in cab design. The M-Cab and the Crew Cab. Both the cabs have an ergonomic design and head turner styling. The cab design itself gives more comfort in extreme terrain; specifically on rough roads. The M-can has a strategic positioning behind the front axle. The extra space at the back of the seats gives extra space to carry gears. The crew cab is very useful in case you have to carry your crew somewhere. The crew cab has a seating capacity of seven with the driver. Furthermore, the engine and other components are easily accessible from the front by opening the bonnet. So, you don't need to tilt the cab in order to access critical components and the engine itself. Thus, passengers can remain seated inside the cabin during maintenance. In addition, the Zetros cab has higher visibility and better all-around safety. The passive safety features add to the passenger safety along with impact absorbing engine placement at the front. The absence of engine tunnel increases the overall roominess of the cabin along with ease of movement. The three-point mounting is placed in such a way that it will have less lateral disturbances. Powerful engines ready to tackle all terrains. The Mercedes Benz Zetros comes with two engine options. The OM 926 LA and OM 457 LA. Both the engine are inline 6 cylinder engines, churning out 326 Hp and 428 Hp of power as well as 1200-1600 Nm and 2100 Nm of torque respectively. The speed VG 1700 transfer-case gives one road ratio and one off-road ratio along with the switchable center differential lock. Hence, it ultimately gives high stability by compensating rotational speeds of the front and rear axle wheels. The 326 Hp engine comes with the option of a fully automatic 6-speed gearbox. In addition, the 326 Hp engine also comes with 9 forward gears manual transmission and 428 Hp engine with 12 forward gears manual transmission. The cast axles are capable of taking high loads. The front axle can take 7.5 to 9 ton of load while rear axles can take from 13-16 ton of load. The straight bolted type ladder frame chassis gives superior torsional flexibility and safe handling on any kind of terrain. The Zetros 4x4 and Zetros 6x6 come with varying lengths. The front axle has a two suspension options with 3 or 4 leaf parabolic springs. The leaf spring has a different design than traditional ones. The leaf springs are not placed on top of each other but they are placed with some gap in between for corrosion protection. The Telligent system keeps smoother interaction between the driver and the engine. It also keeps smoother interaction between different truck components such as the chassis, engine, and brakes. The automatic cut-outs help to diagnose faults faster. In addition, you don't need to carry additional fuses with you. By simply checking the switch position, you can find out the problem. In addition, the Telligent maintenance system keeps track of all the wear and tear and keep the data ready when the maintenance crew needs it. It ensures faster maintenance and lowers downtime. Thus, it reduces the overall cost of operations. The Fleet Board management system in Zetros makes vehicle management much easier. It's telematics-based internet service that lowers the fuel consumption by keeping track of driving behavior of the drivers and trucks. The permanent all-wheel drive systems give great handling with stability along with directional control to the driver. In addition, the differential locks ensure equal power delivery to all wheels. In conclusion, the Mercedes Benz Zetros is capable of keeping you moving on almost any terrain with its technology and power.